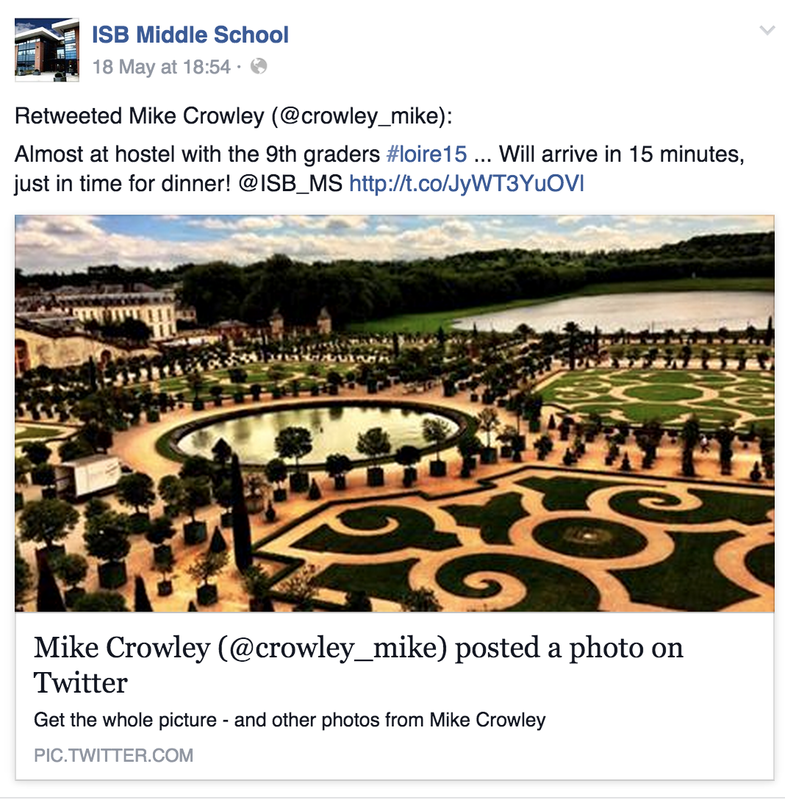 During this past week, our middle school Facebook page received almost 5,000 views, all based upon our Twitter feed from field trips to Alsace, Normandy and the Loire Valley. This has historically been a week during which we have been deluged with phone calls and email queries about the welfare of students during these week-long excursions; this year things were quiet and parents were more engaged than ever before. From quick updates on our journey progress to snapshots of key learning experiences and social contexts, parents were able to follow our daily adventures in an informal, non-intrusive, yet informative way and our three grades were able to engage with and follow each other. 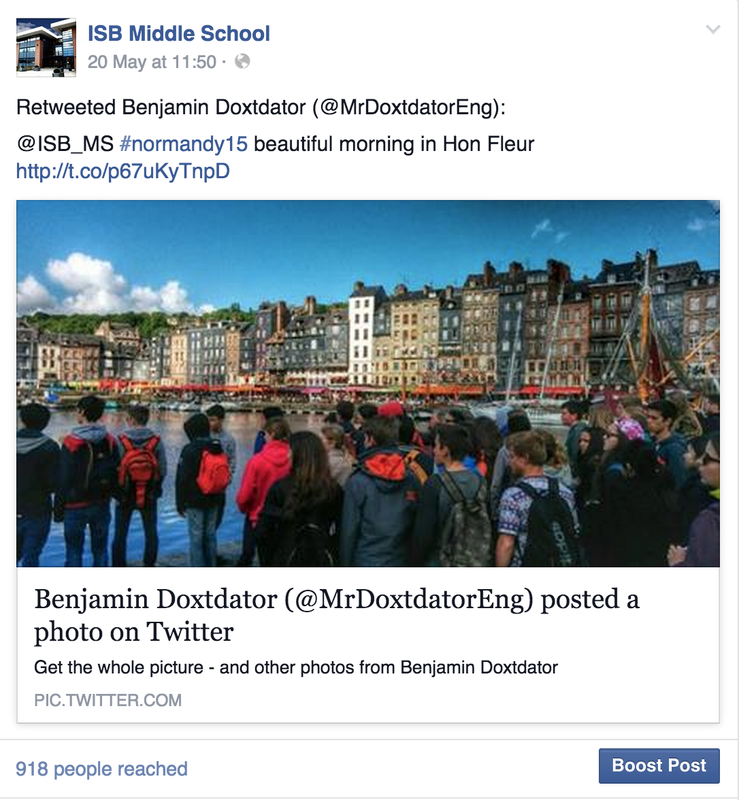 Posting a tweet, of course, took very little time and, as we had our feed automatically linked to our Facebook account and our school’s community portal, the technology platforms automated our news updates to all interested members of the school community. It was an effortless and engaging way to build community and share our learning story. This same simplicity also applies when it comes to using social media as a personal learning network. Why is it then, one wonders, that many schools continue to fear or even restrict social media? Why is it that so many school leaders, instead of embracing the idea of becoming connected educators, seem determined to dedicate energy to designing policies and procedures intended to prevent and control the use of social media in schools? During the school trip, when not sending the occasional tweet, I enjoyed reading What Connected Educators Do Differently by Todd Whitaker, Jeffrey Zoul and Jimmy Casas. It proved to be an essentially thoughtful, practical, and commonsense guide to why educators must embrace social media tools as part of their professional learning and leadership imperatives. The case for this is articulated simply and clearly: “If we want to prepare our students for the rest of this century and beyond, then we must quit living in the last half century and recognise the value of becoming not only connected educators, but also connected, lifelong learners. The more we consciously strive to serve as connected leaders, the more likely it is we can support our students in becoming connected learners.” The alternative possibility – continuing to operate schools as islands of fearful isolation – is really no alternative at all in our digital society. The authors make the fundamental point that the world we live in, “is like the Industrial Revolution crammed into 15 years instead of 150”, yet schools, they contend, continue to facilitate linear rather than exponential change in response to this revolution and nowhere perhaps more obviously than in terms of engagement with social media. While most schools ostensibly work hard to ensure that students are offered the most meaningful and worthwhile learning experiences, sometimes it is with a frowning, eyes-raised-to-heaven dismissal of the connected world that our young people inhabit and need to be prepared to work in. Whitaker, Zoul and Casas make the point that, “the challenge facing schools today is the ability to cultivate a culture wherein all members of the school community feel comfortable in disrupting routines long established by the status quo and embrace a connected world which is ready to support their desire to learn without limits.” This requires leadership, risk-taking, personal learning and conviction. 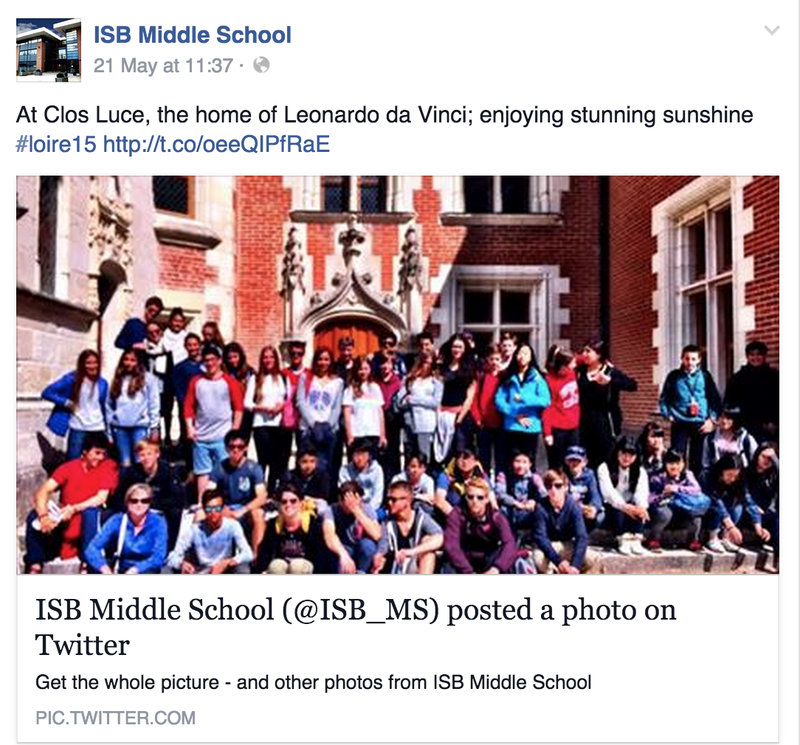 Photographs of students may not be posted on social media platforms. In our experience, parents love to see their children photographed and celebrated in online, authentic learning contexts. In fact, they tend to follow enthusiastically. Teachers may not connect with students using social media. So, we trust our professionals to engage with their students in person, but assume ill-intent and irresponsibility in a remote, online context? There’s a red flag here somewhere. The most pertinent context of parent information meetings is: technology is dangerous. We spend a considerable amount of time helping parents recover from such unfounded fears. I think the real school fear here is fear of parents, not technology dangers. Acceptable Use Policies focus on the negative and IT departments use filters to block websites. This might make sense in organisations whose main purpose is not education. Our students need to be connected to the digital world in which they live in informed and meaningful ways; we need to help our teachers become engaged and empowered to take risks; we need parents to understand and embrace the monumental learning opportunities at our disposal and the opportunity for us to engage as a community. This is where digital leadership is required, what Eric Sheninger describes as, “the need for current leaders to be catalysts to drive sustainable change that will transform school culture. Only then will schools produce learners ready to take on the world and able to succeed in a demanding society ever more reliant on digital fluency and an entrepreneurial thought process. Leaders must begin to map out collective responses that focus on positive solutions to the problems inherent in school culture.” The problems inherent in school culture include a belief that while the whole world is being transformed radically and powerfully, schools somehow have the right to trail slowly behind. We recently hosted a conference led by our seventh graders in which students shared their knowledge about social networks and offered training sessions to peers and teachers on how to use the various tools and platforms. The central theme of this event was a focus on the power of the internet and social media in particular. While responsible use was highlighted in the context of intentionally developing a personal digital footprint, the event was notable for the profound absence of the fear factor that can be the hallmark of schools talking about technology. (I have written a previous blog post about the fears that can dominate our discourse around educational technology.) Our students, having watched the inspirational TED talk by Scott McLeod on empowering young people to harness the power of the internet were subsequently thrilled when he sent them a short video message which we shared at the start of their conference. McLeod’s message was simple: be awesome, 7th graders. The same message is pertinent to all educators today. Image Credit: Elie Benaym (grade 8), Normandy. Posted in digital learning and tagged blogging, change management, connected educators, edtech, innovation, leadership, learning. Bookmark the permalink.